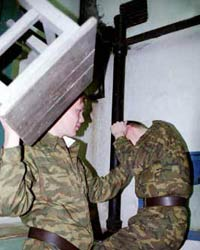 In the Soviet army, as in the current Russian one, the practice of “hazing” (dedovshchina) flourished. The old-timers – “grandfathers”, to use the soldiers' slang, mercilessly abused the "spirits” – the rank and file, who did not have an eighteen-month period of service behind them. And the rank and file subsequently got their own back on the new recruits. This system of mutual subordination permeated the army from top to bottom, making it easier for officers to gain control of their units. The scheme worked until the Chechens found their way into it. They recognized neither "grandfathers" nor "spirits", nor even the officers, sometimes. Any attempt to wound their dignity on the pretext of their "greenness" was met with fists. The “smells” (soldiers who had just taken the military oath) from Checheno-Ingushetia nearly always crushed the “demobs”, and set up arrangements within their units that suited them and were often founded on violence. Much has been written about the nature of hazing in the Russian military. But no one (I do not think I am wrong about this) has ever studied the phenomenon in relation to the behaviour of representatives of different ethnic groups. Why did the Chechens behave in one way, and the Russians or Balts in another? Why did a system that promoted the institutionalized suppression of human dignity cause an outcry in some and a desire to resist, while others bowed before it? One should not generalize, perhaps. In my experience, there were plenty of Chechens who "broke" and eagerly complied with the will of their tormentors. The events of today clearly demonstrate that there is no longer a single, united Chechen people with a single, united character – if ever there was, indeed. So the reflections that follow are mainly about typical behaviour. Why did it vary so much between different ethnic groups, what was the reason for that? I don’t know whether I am right or not, but it seems to me that in most cases the ability or desire to resist violence does not depend on a person’s educational level or religion. Take the Lithuanians, Latvians and Estonians, for example. They didn’t do much to resist the hazing in the army, but even in humiliation they tried to maintain their dignity. As if to say: I won’t respond to the cuffs and head-butting, I am above that! And indeed, when they became “demobs” they did not beat or humiliate their colleagues. As a rule, the Russians and Ukrainians endured it, bottling up their rage in order to pour it out on others when the time was ripe – on those who were younger and more defenceless. The ones who surrendered immediately and irrevocably until the end of their period of service were the Uzbeks, Tajiks and Turkmens. They were the most disenfranchised group of all who served in the Soviet army. The natives of the Baltic republics were better educated and more cultured in the modern, Western sense of the word. Likewise, they seemed to attach a greater importance to the concept of honour and dignity. At any rate, they knew what honour and dignity were, they took account of them. However, they kept their high level of education and their desire to protect themselves from humiliation in two separate categories, and did not let them interfere with each other too much . The Slavic recruits were also well-educated. In this respect the average Russian or Ukrainian was superior to a Chechen or Uzbek, for example – though perhaps inferior to the Balts. The Slavs did not do much to go against the system, however, and did not try to break it. They just adapted to it, first letting themselves be crushed by it and then mercilessly crushing others when it was their turn. With few exceptions, the recruits from Central Asia were right at the bottom of this setup – ill-educated, they showed practically no desire to protect their dignity. In other words, a person’s level of education did not explain (and probably does not explain now) a person's behaviour in a totalitarian environment. It seems to me that the Chechens, with their average, very mediocre education, showed more respect for the human being in themselves than their compatriots from the north and west of the country. I think that the behaviour of the Balts in the Soviet army can be simply explained by their European rationality. They saw that they needed to defend themselves where it was possible, where it would bring some kind of positive result. But if it was going to be too difficult, or involve excessively high costs, they decided they had to put up with the hazing.